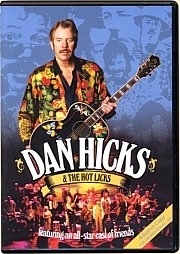 It was a very special night in December 2002 when Dan Hicks‘ 60th birthday was celebrated in a grandiose style at the Warfield Theater in San Francisco. An all-star cast of friends, featuring various members of Dan’s past and present bands, joined their friend to celebrate with an unforgettable night of memories, stories, and magnificent music. Octalouie principal Jesse Block was brought as associate producer & technical director for video production of this event, coordinating camera operations and technical logistics. Octalouie principal Eric Predoehl also worked on this production, credited on the DVD as one of the live audio engineers.